Now, before we get complaints from hard working effective Security Guards, that is not our opinion!!! But…..nonetheless, the Security Guard can be perhaps a second option to today’s advanced technological security systems….. The Security Guard can also do the same thing, but are they potentially in personal danger if they approached the intruder? Are they simply going to do the same as the Monitoring Centre and call the nearest person/authority? If so, perhaps it is safer, quicker and cheaper to employ the services of a dedicated Monitoring Centre instead? And, as more and more end user sites become automated with barriers/gates etc, clever modern DVR’s also have the ability to trigger relay outputs so as to remotely allow speech, gates/barriers etc to be controlled….. 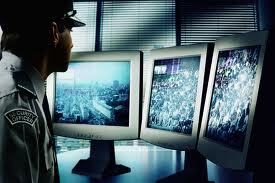 So have a think, could your system be better utilised with a Monitored Centre? Contact us today and we will put you in touch with the Professionals! Monitored CCTV. Stop security breaches. This entry was posted on Friday, January 7th, 2011 at 07:30	and is filed under CCTV. You can follow any responses to this entry through the RSS 2.0 feed. Both comments and pings are currently closed.